At Tastebuds, we’ve been refining our skills for over 20 years and our team of former campers, Certified Kid's Food Specialists and unique chefs are among the many things that put us in a league of our own. Staying true to our core values, our focus has always been to deliver not only delicious food, but nourish the body and soul of our youth and staff at camp. Our goal is to supplement the memories and personal bonds developed at camp with the idea that camp food is something to look forward to. ✓ Do you have overnight camp and day camp running simultaneously? ✓ Do you have food service challenges that you are just not sure howto overcome? ✓ Do you have a lot of food packouts, trips or special events? 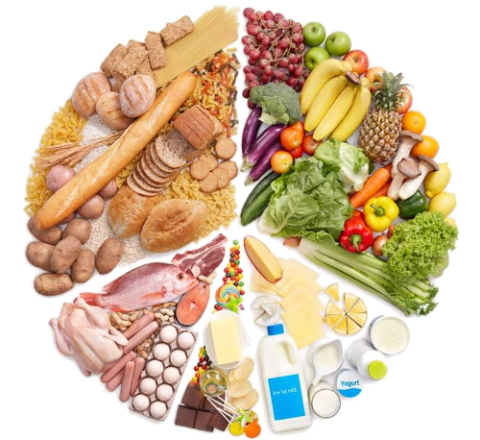 ✓ Do you have a large variety of dietary restrictions? ✓ Does your camp adhere to particular religious food choices? We are experts at camp food service customization and execution. 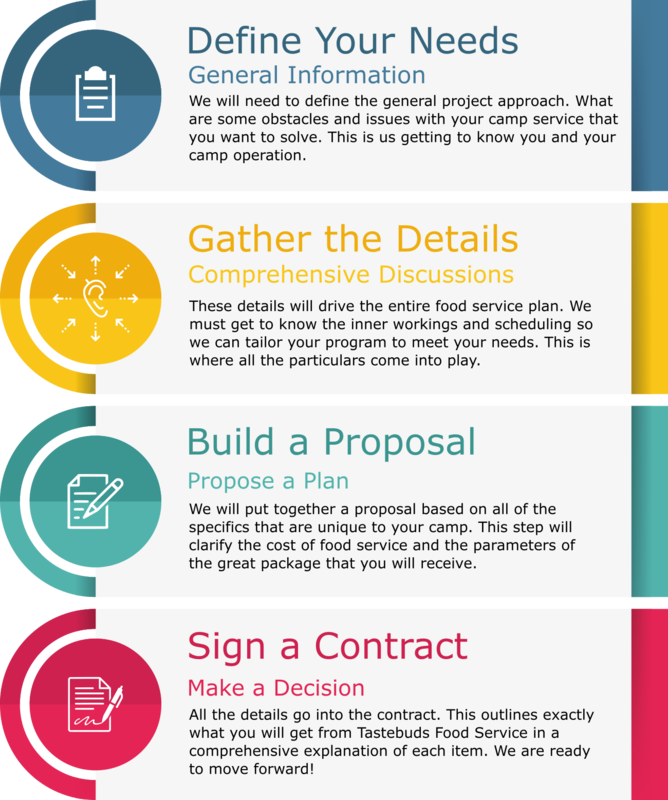 We will gather all the necessary info from you as we build a comprehensive plan for your upcoming camp season. 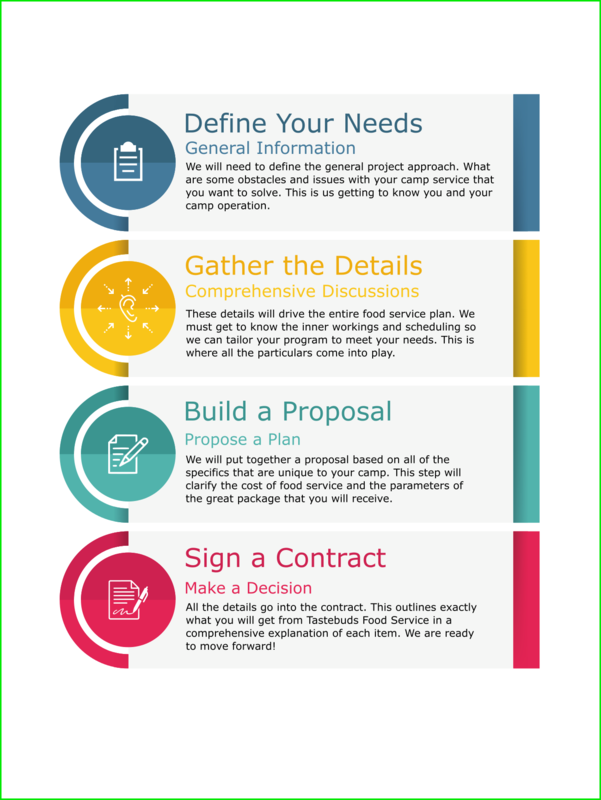 This creates a setup for success, mapping out the moving parts into a thorough food service package that will give you peace of mind. Contact us and we will work with you towards a successful Food Service operation. We believe in providing well-balanced, tasty and nutritious meals. That starts with encompassing fresh fruits, veggies, lean meats and healthy fats such as canola and olive oil in our food preparation. Since variety is exciting, we believe in rotating our menus so there is always something new and fresh to look forward to. We enjoy educating our youth about eating healthy and take pride in bringing a fresh approach to your food service! Our kitchen staff often develop lasting friendships with camp directors, counselors and campers they cater to. In fact, there are many times that staff have been specifically requested year after year by Camp Directors because the relationship cultivated was so symbiotic.